Adding a New Register – How can we help? Adding a new register allows you to use Vend on an additional device. When you add more registers, this will automatically update your billing if required. A prompt will appear to advise you of any billing changes before you add the register. If you want to check your plan and billing information, head to the Billing tab in the Setup menu. To add a register, first, navigate to the Setup tab and click on Outlets and Registers. Once here, click on the Add a Register button within an existing outlet or create a new outlet to create a new register there. This will take you to the register setup page for the outlet you have chosen. Here, you will need to fill out the register details, receipt information and end of sale options for this register. Note: If you wish to add a register on your iPad, you will need to select Menu, followed by Dashboard, before you follow the Setup steps above. Register name - Identify this register. This is particularly important for multiple registers in one outlet. 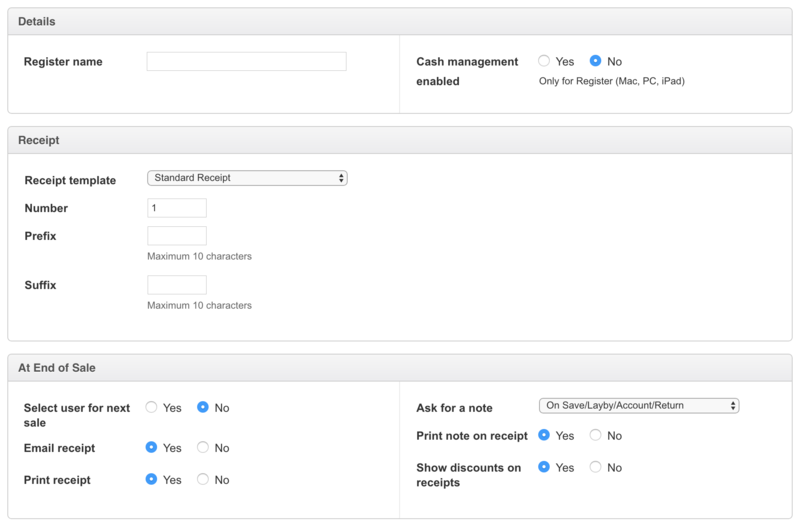 Cash management enabled - Choose whether to enable cash management options for this register. To learn more about cash management, click here. Quick Keys template - Choose which Quick Keys template you wish to apply to this register. If you haven't set up your Quick Keys yet, you can learn more about configuring Quick Keys template here. Receipt template - Choose from the standard receipt template or customise your own. Number - This enables you to set the start point for receipt numbering. Unless you would like to start numbering receipts from the end-point on your previous POS, leave this as-is. If you would like to start numbering from your end-point, enter the last receipt number from the previous register. Prefix - This is to identify sales made from this register. It's useful when you have multiple registers at one outlet. Suffix - This is to identify sales made from this register It's useful when you have multiple registers at one outlet. Select user for next sale - You can be prompted after each sale to select the next user. This is helpful for multi-user retail environments, where you want to track sales for each user. Set this to Yes if you want the turn on prompting. Email receipt - If you would like to email receipts, choose Yes. After every sale, you will be prompted to enter an email address for the receipt. Print Receipt - If you would like to print receipts after sales, choose Yes. You can also print one-off receipts using your computer's printing shortcut, such as Ctrl+P for Windows, or Command+P for Mac OS X. Ask for a note - Choose when you would like to be asked for notes on a sale. Options are Never, On Sale/Layby/On Account, or On All. Print note on receipt - If you would like the notes you have added to be printed on the receipt. This can be useful for table numbers, returns numbers, and more. Choose No if you wish to use notes for internal purposes. Show discounts on receipt - Enable this feature if you would like discounts to be displayed on receipts.